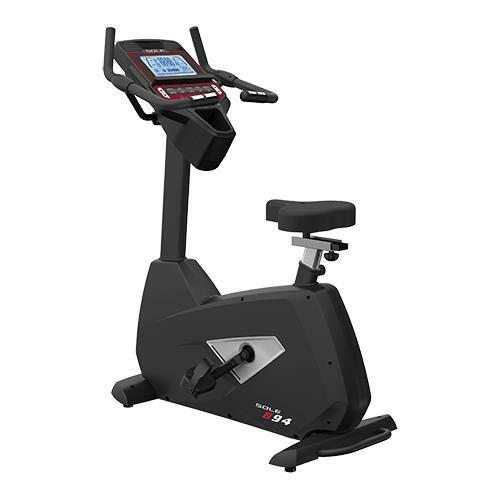 Focusing on comfort and challenging cardio workouts, the Sole B94 upright bike is an attractive and well-designed piece of cardio equipment that offers quality and no-nonsense programs to help you get and stay in shape. The 9" blue backlit LCD display shows standard readouts for your exercise session. It offers 6 pre-set programs for fat burning and cardio workouts, plus 2 user defined, and 2 Heart Rate Control workouts. Check out the popular B94 Upright on Sale Now at the Sole Store! The Sole B94 upright bike has a steel frame, a smooth 26-lb flywheel system, console-controlled resistance with 20 levels, and an adjustable seat (fore/aft, and up/down). The pedals have a slight inward slant to be more ergonomically comfortable for the foot position. There are heart rate sensors on the handlebars to use with the HR Control programs as well as check your HR periodically during the session. A workout fan helps keep you cool while you ride, and there is a built-in sound system so you can plug in any MP3 player such as an iPod and listen to tunes through the integrated speakers. Reviewers find the Sole B94 upright to be a well-designed, well-built model that will be a winner for Sole’s new line of exercise bikes. To sweeten the deal, the bike comes with a generous 1-year in-home labor warranty as well as 3 years of coverage on all parts and electronics, and lifetime on the frame. The B94 was redesigned in 2016 to incorporate Bluetooth technology, which allows you the sync your workout results with Sole's app and other popular fitness apps. Many of Sole's other bikes, ellipticals and treadmills were also redesigned with Bluetooth. This is definitely a step in the right direction as one of the drawbacks of all of Sole's exercise equipment has been their lack of interactivity. The addition of Bluetooth workout syncing brings the company closer to their competitors, many of which have offered workout tracking for many years. Kudos for Sole for spotting a niche in exercise and fitness equipment that needed to be filled. There is a dearth of quality exercise bikes right at the $600 to $900 range, so Sole easily jumps to the front of the pack with this solid model. At $799, Sole B94 upright bike gives the Kettler X1 and the Lifespan C3 bikes a run for their money. It is an excellent investment and you can buy with confidence from Sole, a company that can boast about its many award-winning home fitness machines produced over the last 20 years.